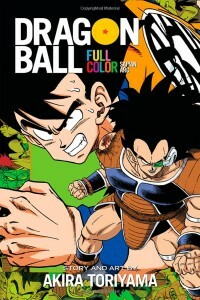 One of the biggest Dragon Ball releases last year was the reissue of Dragon Ball Z in color. originally made the for the Japanese audience it’s finally been translated by Viz and will be available February 4th on a limited initial release. In Japan all the Manga was colored from the original Dragon Ball series all the way through to the Sayans, Freiza, Cell and Buu. At the moment you can pre order the first three issues. Although the releases look far apart they look to be extended volumes as the original release of volume 1 was 192 pages but the color version looks to be 248 pages which would mean this collection might only be 15-20 volumes and not the 26 in the old collection. At the moment we don’t know if the translation is exactly the same as the last one Viz did or if it’s been revised again and another thing that would make me throw money at Viz right now would be to see a full color and uncensored version of Dragon Ball in manga form. Strangely enough the first Dragon Ball manga had more censored parts that the Dragon Ball Z manga.